My latest for Reader’s Digest really opened up my eyes to clothing donations, have a read below, or here for the full article. While you may donate your old clothing to charity, truth is, even then, a whopping 84 percent of our clothing ends up in landfills and incinerators, according to the EPA. The Council for Textile Recycling reports that the average U.S. citizen throws away 70 pounds of clothing and other textiles annually. The journey is very bleak for fast fashion wears. For an example, let’s take that fluffy, boat neck poly-blend cream sweater that was gingerly coddled and featured in your Instagram flat lay—but that now, weeks later, you’re ready to part with. Let’s follow it through a few different scenarios. Here are the skinny jeans of it all. 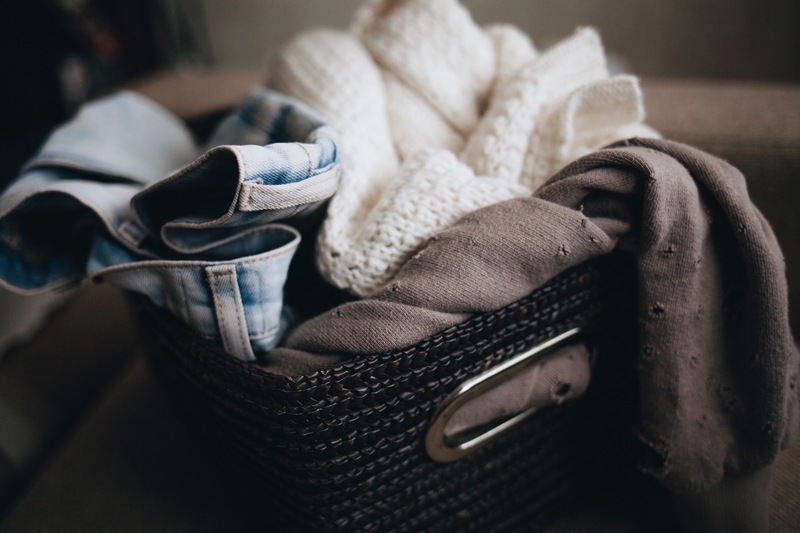 If your sweater isn’t picked up in as few as three to four weeks’ time, it can end up as carpet padding, insulation, and rags—or even overseas. “Unless your clothing has mildew or has been stained with a solvent like gasoline, textile waste mills can recycle it,” explains Cassi Happe, founder and sustainable fashion journalist at Curated Cassi. Textiles are cut into rags for industrial waste or ground into fiber to make insulation, carpet padding, yarn, or paper. The upside? Recycling does reduce our greenhouse gas emissions. In 2014, the 89 million tons of municipal solid waste, like paper, plastic, and textiles recycled provided an annual reduction of carbon dioxide equivalent emissions comparable to removing over 38 million passenger cars from the roads for one year. Unfortunately the same can’t be said for small African villages impacted by hefty boxes of used garments making their way across the ocean. “Many textile recyclers will take a portion of the clothing that they don’t think they can sell in the U.S., package them up in by gender, size, and season, and create huge bundles of clothes they then sell by weight to be shipped to less developed countries,” explains Jen Zuklie, founder of The Swoondle Society, an online children’s used clothing platform. These items are then sold cheaply at “bend over” street markets, where customers bend over to select garments laying on the ground, and it’s made a devastating impact on local indigenous markets. Countries like Rwanda, Kenya, Tanzania, Uganda, and Burundi are seeking to ban clothes and shoe imports to protect local businesses. Pulling over for a donation bin to send said sweater on its way? Many of those bins are actually for-profit textile recycling companies falsely posing as charitable organizations or donating a small percentage of profits in order to operate legally. Since only 10 percent of items donated to an actual store get sold, cutting out the middleman and not wasting manpower at goodwill stores may seem like a good thing. But this practice takes money away from the legitimate charitable organizations. Retailers including H&M, GAP, Patagonia, Levi’s, Madewell, and others have announced in-store programs allowing customers to bring in worn garments. These are sorted to be donated or recycled—turned into insulation, rags, or, more misleadingly, recycled into textile for new garments—sometimes in exchange for a discount voucher. Sadly, recycling old wears into new ones weakens the fibers and clothing made from multiple fibers, say 95 percent cotton and 5 percent spandex, makes it tough to separate thin fibers to their native components. In fact, H&M’s 2016 sustainability report admits only .7 percent of the materials used in new clothing has been recycled. Nationally, less than 1 percent of clothing is recycled to make new ones. Technology is improving as Levi’s has shown by creating its first 100 percent recycled cotton jeans, however, their prototype did weave in virgin cotton. Oh, but your t-shirt is made from 100 percent recycled cotton you say? This post-industrial recycled cotton wasn’t spun from an old button-down but from new fabric scraps from a factory’s cutting room floor. Feels a little deceptive, no? Nearly 85 percent of us dispose of clothing in the same trash we dump our kitchen scraps, amounting to a staggering 13 million tons of textiles per year, which is an average of over 70 pounds per person. We’re talking roughly 100 garments per year that sit in landfills waiting to decompose for as long as 200 years. Can you even visually recall 30 shirts that are in your closet right now? You’re thinking, sure, it may take a while, but it’s just taking up some space, right? Well as that poly-blend sweater decomposes, it releases greenhouse gases like carbon dioxide and methane, polluting the environment further. And this is after its creation that also took a toll on resources. Levi’s has found that making one pair of 501s required almost 920 gallons of water, 400 megajoules of energy, and expelled 32 kilograms of carbon dioxide. This is equivalent to running a garden hose for 106 minutes, driving 78 miles, and powering a computer for 556 hours. According to The Secondary Materials and Recycled Textiles Association (SMART), 95 percent of all clothing and household textiles can be recycled or repurposed. We need a fast fashion diet as much as the fast food variety. Buying less and wearing it longer is akin to the adage of fewer calories in, more calories out. Buy better, more durable clothing. Find ways to repair it, upcycle with ideas from Pinterest, sell or swap online, donate to a charity that wants a specific type of gently-worn clothes (like a coat drive or prom dresses), or use it for rags around the house. (Here are some ways to make your favorite clothes last longer.) As a last resort, always recycle. As we can see, any scenario for that cozy pullover innocently purchased on a whim further keeps exponentially impacting our environment and communities. Part of this is changing our mindset, too. Don’t justify a purchase because you think it’ll have a robust second life once you’re through with it. Check out how to donate just about anything.